On Sunday, February 12, the 5th Annual Borshch Cook-Off took place in our church hall. As in years past, this event was organized by the Project Committee, consisting of parish members Iryna Carman and Olena Stetskevych, to raise funds for a children’s orphanage in the city of Kryvyi Rih in the Dnipropetrovsk region of Ukraine. For the first four years, the funds supported Orphanage #2 where many of the orphans were HIV positive, deaf, had mental health problems, developmental delays and other serious health conditions. Orphanages in Ukraine are severely underfunded and the funds raised by the Borshch Cook-Off allowed us to cover the costs of buying everyday essentials for the children. In addition, these funds were also used to provide living essentials (such as cooking utensils, plates, towels, blankets, etc.) to the children leaving the orphanage, at the age of 17, so that they can start their independent lives in hostels that do not receive adequate social assistance. Over the past two years, Orphanage #2 has been gradually restructured into a rehabilitation facility. As a result, another orphanage was chosen by the Project Committee and our volunteers in Kryvyi Rih (Nadiya & Bohdan Petryk and Liliya & Vitaliy Stetskevych, parents of our parish members Olena & Victor Stetskevych). The majority of these orphans are dependent on others for personal care as they need assistance to eat, wash themselves, dress, and for many other daily functions. Some of the children have been abandoned by their parent(s). All the funds collected will be spent for the specific needs of these children. The Project Committee and the volunteers in Kryvyi Rih are in direct communication with the orphanage’s administration. Items are purchased in Ottawa and sent to our volunteers in Kryvyi Rih or a specific amount of funds are transferred to our volunteers to cover the cost of buying the most highly needed items in Ukraine. Funds are not sent to orphanage employees, but only to our trusted volunteers, who always provide the Project Committee with purchase receipts as well as photos of the items being delivered to the orphans. This year’s Borshch Cook-Off was again a great success. A big thank you to the following 21 home chefs that prepared and brought their best borshch in hopes of winning the honour of being the “Best Borshch” – Svyatoslav Andrieiev, Inna Artyshchouk, Oleh Belkin, Nataliya Burchevska, Natalya Chabaniuk, Raisa Hordiychuk, Joyce Hung & George Pawluk, Zora Jackson, Pavlo Ignatusha, Oksana Kavera, Anton Krasnov, Lisa Malarek, Svetlana Nepogodina, Larissa Okhrimtchouk, Zoya Olinyk, Angie Reshitnyk, Nina Romas, Suzanne Soroka, Michal Voytinsky and the Embassy of Ukraine. Despite the snowy weather outdoors, about 100 people enjoyed the warmth of cups and bowls of borsch and the happy community spirit. 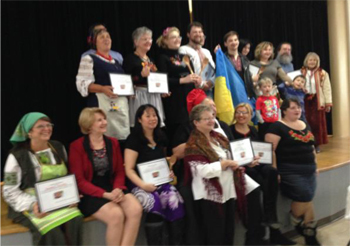 The first place winners were parish member Pavlo Ignatusha for Best Vegetarian Borshch, and the Embassy of Ukraine for Best Meat-based Borshch as well as Best Presentation. This year’s event raised almost $2,000 for the orphanage. Over the past five years, this event has raised almost $9,000 for the two orphanages that have been supported. The organizers would like to thank the many volunteers for their time, efforts and contributions and the Black Walnut Bakery (Cumberland, ON) and Lakomka Deli (Baxter Road, Ottawa) for their donations to the event. Thank you to all who participated in the event and for your generosity. Donations are still being accepted. If you would like to donate to this very worthy cause, please contact Iryna (email: iccrph@gmail.com) or Olena (email: ostetskevych@yahoo.com). Tax receipts for the 2017 tax year will be issued for donations of $10 or more.